Mechanical engineer Stephen Pakbaz's LEGO version of NASA's Mars Science Laboratory rover, Curiosity — now with step-by-step instructions. Two weeks before NASA's Curiosity rover lifted off for Mars last fall, one of the engineers who helped build the Mars Science Laboratory (MSL) spacecraft launched his own attempt at getting LEGO to produce a toy version of the six-wheeled rover. Eight months later, the real rover has safely touched down inside Mars' Gale Crater, but Stephen Pakbaz's brick-built Curiosity has yet to land on toy store shelves. His model however, now has do-it-yourself instructions. Last year, Pakbaz posted his design for a 313 piece, 1:20 scale version of the Curiosity rover on LEGO's CUUSOO website, where the public can vote for fan-created LEGO sets. If 10,000 or more people cast their support behind a particular design, LEGO says it will consider producing it as a commercial model. 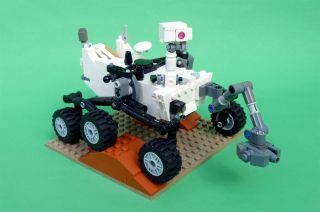 Since Nov. 15, 2011, Pakbaz's LEGO rover has received just over 1,500 votes. Even with the boost offered on by the real Curiosity rover landing on Mars on the night of Aug. 5 (PDT; Aug. 6 EDT) — more than half of the votes to date were cast over the past week — the project has a long way to go to before LEGO will look at it for possible production and release. But that doesn't mean LEGO rovers aren't already landing in living rooms around the world. This is the first image taken by the Navigation cameras on NASA's Curiosity rover. It shows the shadow of the rover's now-upright mast in the center, and the arm's shadow at left. The arm itself can be seen in the foreground. Image released Aug. 8, 2012. About a month ago, Pakbaz began freely sharing a set of step-by-step instructions to build his model. Just like the guides that are packaged with LEGO's commercial sets, Pakbaz's instructions use depictions of the toy bricks to show the order that the 313 pieces snap together to create the rover. The 46-page digital document outlines 38 steps needed to build Curiosity, with numerous subassemblies as well. "The PDF instructions are as good as it gets," wrote the same commenter who had built the bookshelf-bound rover. "The instructions were great and easy to follow," another commenter wrote. "Even better were the extra educational bits explaining each feature of the rover." "I combined [my] first-hand experience with my LEGO hobby to create a LEGO model that was as faithful to the actual rover as possible in terms of accuracy, details, and mechanical function, while remaining at a reasonable size and cost," wrote Pakbaz on the CUUSOO website. As a mechanical engineer at NASA's Jet Propulsion Laboratory in Pasadena, Calif., he was involved in some of the design and testing of the real spacecraft. With Pakbaz's instructions, anyone can now build their own LEGO Curiosity rover. All they need is time, a bit of imagination and of course, the 313 toy bricks, bars and wheels that form the model. The guide includes an illustrated inventory list, but it's up to the user to find the parts. For some LEGO builders, the pieces may already be lying around. For example, if they already have the five recently released space exploration LEGO sets, including four kits that LEGO partnered with NASA to produce and the large "Shuttle Adventure" that was first sold last year, then they already have 118 of the bricks, or 38 percent of the pieces required. Pakbaz created his rover using relatively common parts, so other earlier released LEGO sets could yield the other pieces needed. To further assist, Pakbaz has also added his model to Rebrickable.com, which lets users search by the kits they already have for the other LEGO models they can build. The Rebrickable website can even suggest parts that are similar to those in Pakbaz's Curiosity model, which can be used instead (in the previous example, the five space sets yield 16 more bricks that are close in shape or color to the suggested pieces). Otherwise, the parts can be obtained piecemeal, through services such as LEGO's own "Pick A Brick" store or the unofficial site BrickLink.com, which matches buyers with sellers based on the bricks being sought. Based upon the parts list, the Curiosity model costs about $50 to build. That's a small investment for what Pakbaz hopes will be a big return. "The primary purpose of this effort has been to contribute to the educational outreach for this incredible mission," he shared on LEGO's CUUSOO site. "It is my hope that this model encourages the public support that is integral to the continued development and exploration of outer space." To find Stephen Pakbaz's LEGO Curiosity instructions, for more information, or to add your support for his model to be produced, see the LEGO CUUSOO website.